Home News Where will the stop destruction of the economy in Pakistan? Where will the stop destruction of the economy in Pakistan? Finally, all the terms of IMF have been officially accepted. If something remains vacant then it is about to implement these terms. For example, IMF insists that the government has no power to disagree with the dollar than the dollar should be. Instead, this option should be with the State Bank so that the IMF could hit the Pakistani economy by unnecessary and unwanted rupees. Pakistan’s position is that whenever you want the government to be more and more, we will do so much to the rupee. At present, let this option stay with the government. Later, this work will also be carried out. Similarly, there is a difference in the government’s own ranks that how much a loan is taken from the IMF. 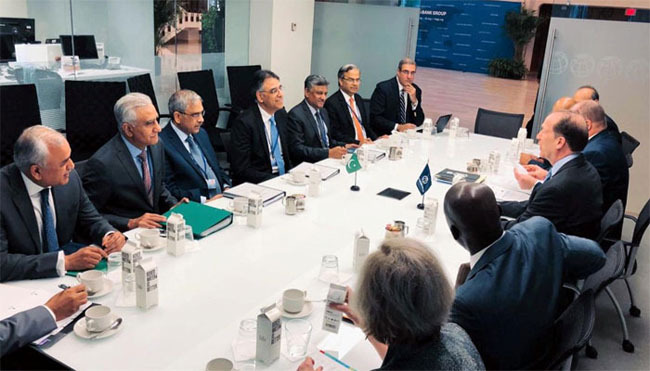 Asad Umar and his supporters say that as much as needed, the loan should be taken so much while Jahangir Tareen and his colleagues are standing, when all the terms of the IMF have been recognized, but even if they have been implemented, IMF should be borrowed $ 12 billion from which the negotiations continued, because IMF’s debt rate interest is extremely low. The rupee of rupees on the IMF’s statement continues. It is estimated that one dollar will be equal to 150 rupees in the next few months. The Pakistani currency is also the most unchanged currency throughout the region. This rare rupee of rupees has spread a storm of inflation that everywhere is sound of love. Economic activity in the country has become almost frozen, due to which the government has declined significantly in every revenue. Due to lack of income and rising expenses, the government is forced to take a loan on every condition. At this time, the government is disturbing on the Federal Board of Revenue to get deposited in the government treasury by getting maximum tax. While the real situation is that there are several periods in which the tax recovery rate is zero. At present, government officials are enjoying joyfully that import imports have reduced the import bill but since the imports of this imports are affecting the impact of the domestic economy, nobody is watching it. Due to lack of imports, it is not that their alternative has started to be developed in the country, but due to this, the power of people is a great draw. Along with this, import duties and other taxes have also declined greatly. FBI has begun issuing fake tax challans to taxpayers due to the government’s intention to meet the tax targets. Rather, they are also deducting directly through the mentioned tax banks, which has led to a new wave of reimbursement in the taxpayers. Tax authorities acknowledge that the challans they are wrong are wrong and in the first appeal in the Appeal Court, these funds will have to return them. However, tax officials say it will take one, two months and this financial year will end in that period. Thus, their tax target will be met while the amount of refunds taken will begin with the next financial year. His performance in books like this would be the best. On one hand, the government’s government is confessing that the result of recent government initiatives has led to tax encouraging. That is why the Amnesty Scheme is being brought for tax, on the other hand, the campaign continues to fake theft and recover on FBR’s electric style. And this is the end of every government that it does not bring the debt and interest interest taken from a country or institution at any point. Only those parts of these terms are brought to the scene that are attractive to see. IMF’s secretive terms include instant privatization of Pakistani assets. Although the Umar government had initially announced that the list of privatization would be reviewed and, like PIA and Pakistan Steel, which are very important for the country, will be made from the list of privatization. Not only this but these institutions will be completely restored. Mohammad Mian Soomro revealed in the news conference with Federal Minister Najari and Citizen Habazee in Karachi on Thursday. No institution has been excluded from the list of privatization, has just been exhausted. Mohammad Mian Soomro said that PIA and Pakistan Steel will be offered for sale after restoring and making profits. He also revealed that privatization of Pakistan’s airports continues, and there are talks with many local and international companies in this regard. It can be gauged that the old government has kept the country with a group of IMFs. Now whatever measures on the IMF’s order, the domestic economy will be more wasted and then will be applied to the new terms to get more debt. It is a strange situation that the economy of the country is becoming increasingly as the debt is going on in the country. Imran Khan should understand that domestic products will be able to compete in the international market only when the cost will be reduced. Farmers, agricultural medicine and seed prices increase daily, how farmers can afford their cost. When electricity, gas, petroleum and raw materials are extremely expensive, Pakistani products will be able to compete in international markets. Seeing 50 percent of the rupee rupee value is worth a dollar, how a common payable class will be able to fulfill its needs. Imran Khan has only 8 months come afterwards and his performance is that the rate of loans received during his period is highest, At the time of the electricity prices have increased the highest, in such a short period they have done as much as the Pakistani currency, So the previous governments have not done the whole 5 years too. He and his ministers are feeling uncomfortable that one is 130 years old. After this, everywhere in the country, the wave of happiness will begin to rain. Imran Khan and his ministers think that as soon as the oil goes out in the country, the dollar will be raining in the country. They should know what are the deals with oil extraction companies. Pakistan will buy its oil from its own country at international price, while Pakistan will get only 12 percent of the total revenue from the total income. It seems that Imran Khan and his team are unaware of this whole situation, or they live in Utopia and they do not really know even particle information. This time, the situation of Pakistan and agriculture will have become worse, and the people will be asking for prosperity similarly. The way the discovery of returns returned from Pakistan, Imran Khan is left and right in response to this. It would be better to set up a new team of Imran Khan Patriotic Economists who set revolutionary strategy to get rid of the country from the present situation. Start the financial sacrifice at the top and first of the parliament’s members and salaries be deducted. Then after that, the public should be advised to eat one meal. Taxes should be received from the army as public and eliminate the privilege given in exempted duty and other taxes. Those who belong to the judiciary should also end the tax exemption.